World famous Final Fantasy composer Nobuo Uematsu takes some time to speak to ZAM Wikibase Editor Scott "Thayos" Pesznecker about his career. Nobuo Uematsu's music was heard around the world long before he became famous. The 26-year-old musician -- who grew up in Japan listening to Elton John, Led Zeppelin and King Crimson -- was hosting friends at his home when one of them mentioned a part-time job opening at a small video game company. Uematsu applied for the job and got it. Soon after, he was scoring the soundtrack for what would be the company‘s breakout title -- a role-playing game called Final Fantasy. The “Distant Worlds: Music of FINAL FANTASY” concert tour, which is swinging through Seattle, Wash. this weekend, is a compilation of Uematsu’s work throughout the Final Fantasy series. Under the direction of Uematsu and Grammy award-winning conductor Arnie Roth, the iconic music of the Final Fantasy series is brought to life by a full symphony orchestra. Uematsu, in Seattle for this weekend’s concerts, took some time after Wednesday’s rehearsal to reflect on his career and the success of Distant Worlds. Discuss this interview on the ZAM forums! "It's just the ability to see the reaction from the fans overseas, how happy they are to hear the music," he said. “That's a really big lift for me." As a young boy, Uematsu discovered his passion for music while playing around on his older sister’s piano. Although he fantasized about becoming a pro wrestler, he always knew he wanted a career in music. He landed his first paid gig when he composed a radio jingle for an amusement park in north-central Japan. After that, Uematsu mainly focused on his small rock band -- he played the keyboard -- before landing his job with Square. Now he’s a member of The Black Mages, a rock-style band that performs electrifying versions of hit Final Fantasy tracks. He’s constantly touring with Distant Worlds, which recently wrapped up overseas performances in Singapore and Taipei. On top of that, Uematsu is halfway finished with composing the music for Final Fantasy XIV, the second massively multiplayer online game of the franchise. Final Fantasy IX was the last installment of the series to be scored entirely by Uematsu. Roth, the Distant Worlds conductor, has become close friends with Uematsu during the Distant Worlds series. The two work together on a daily basis to convert Uematsu’s pieces into various symphonic arrangements. Roth has written so many arrangements of Uematsu’s work that the concert series may begin returning to cities with entirely different music lineups. Although Roth isn’t a gamer, he’s largely responsible for the birth of Distant Worlds. The idea for the concert series was planted in Roth’s head by a colleague who had performed a Final Fantasy music concert at the 2002 E3 convention in Los Angeles. The show sold out quickly. However, the show’s venue was rather small, and skeptics wondered the show would have sold out had E3 not been happening. Roth’s friend talked to several conductors; none of them took his idea seriously. Roth took a chance on the idea. He planned an all-Final Fantasy concert called “Dear Friends” in Chicago, where he is the musical director and principal conductor of the Chicagoland Pops Orchestra. Just to be safe, he stipulated that the show would only be held if a certain number of tickets could be sold. Roth was floored by the audience’s reverent enthusiasm. In rock concerts, people are usually dancing, stomping and singing along. Classical music fans are usually silent, but it’s oddly common for people to shuffle their programs at the wrong moments or head for the restrooms at breaks in the music. During that first show, everyone was quiet and still. 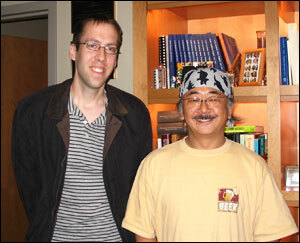 Uematsu wrote most of those tunes in his home office. His many inspirations include 1970s-era rockers, the Renaissance period of central Europe, movies such as “The Godfather” and classical music composers. He said he tries to craft his melodies in a way that anyone can relate to them. He is grateful to Roth for helping him improve his music. In some ways, Uematsu never stopped playing on his older sister’s piano. He is incredibly passionate about his work, yet he rarely feels as if he’s had to study to improve. He’s got the Black Mages and Distant Worlds. A single song can take a few days to write -- “One-Winged Angel” took nearly two weeks -- and a game can take up to eight months to score. That means he’ll have his hands full with Final Fantasy XIV. Uematsu still has lots of music to be made. Only now, people know who he is. Distant Worlds: Music from Final Fantasy will be playing three shows in Seattle from July 9-11 and one more in San Francisco on July 18. Visit http://www.ffdistantworlds.com for show information. I'd like to thank Nobuo Uematsu, Arnie Roth and the folks with AWR Music and the Seattle Symphony for making this story possible. I would also like to thank John Charlton for volunteering his time as our interpreter. It was a pleasure to meet these people who bring the music of Final Fantasy to life. For news, updates, editorials, and interviews like this one, follow the ZAM FFXI team on Twitter! Great piece and I love Uematsu - one day they will make plushies out of him and I will buy them. A superb piece. This one's getting linked to by a lot of people, if I've anything to say about it. I normally don't care who composed a game's music (as it is often mediocre) so I don't follow the names, but his is a name I recognize. I'd have to say his best work was on ff6, which has the best game music I've heard yet. First, Thayos might be half-giant. Second, this is what video game journalism should be; insightful, poignant, intelligent. That's why I come to ZAM for my MMO news. Because of finely crafted articles just like this. Third, reading about Uematsu's journey through a career that seems so fantastic, so well deserved, is incredible. I especially appreciated the humility he showed at the end, as if there is something he is still looking to accomplish.